It’s hard to even know where to start with the Institute for Energy Research’s attack on the regional energy report just released by The Center for the Next Generation and the Center for American Progress. Yes, it is certainly true that in a physical sense, there is a finite amount of energy located within the United States—or planet Earth for that matter—in the form of oil, natural gas, and coal. But by the same token, even solar power is “finite”—the sun will eventually burn out. The sun will, in fact, burn out in a few billion years. But the global tipping point on climate change—the point at which the Earth reaches a 2 degree Celsius increase in temperature above pre-industrial levels—will happen in as few as 16 years if we don’t take steps now to stop it, or at least slow it down. But even if we take a cue from the presidential campaigns and leave climate change out of it, just focusing on the institute’s central economic arguments about the advanced energy future, the institute is still dead wrong. There are two immediate problems with this analysis. First, fossil-fuel companies are profitable in large part because they do not put an honest price on their goods. Instead, they pass the cost of adverse health consequences of a polluted environment and climate change directly onto consumers. The hidden cost of oil-and-gas consumption in the United States in 2011 amounts to a staggering $89 billion, based on the conservative findings of a U.S. Government Working Group that tallied the social cost of greenhouse gases to be about $21 per ton. Other studies say this figure is far too low. Put another way, these companies are putting a product onto the market that causes billions of dollars in health and climate adaptation costs—costs that will primarily be paid by, you guessed it, taxpayers. That’s not even counting the taxpayer dollars that go into protecting these companies’ oil wells and pipelines all over the world. The second problem is even more obvious: The fossil fuel industry takes billions in direct tax incentives and subsidies every year. According to analysis by TR Rose Associates, for the past three decades, the coal industry has benefited from nearly $1 billion a year in subsidized public lands. And the oil-and-gas industry has benefited even more, taking $5.16 billion per year in subsidies in inflation-adjusted 2012 dollars. And these industries have been receiving public support for more than a century. Let’s compare that to the renewable energy industry, a relatively new recipient of government support, which according to the TR Rose analysis receives $390 million per year in subsidies. Biofuels also receive about $1.1 billion per year. Phrased another way: The federal government’s commitment to supporting the oil and gas industry every year is about 3.5 times greater than its commitment to the renewable and biofuel energy industries. There’s a reason the oil-and-gas industry got subsidies 100 years ago, and it’s the same reason the renewable energy industry gets them today: When a country is in the midst of transforming its energy sector, it needs to support its new and emerging companies. Not one single energy technology came into existence in this country without some level of public support. Neither, incidentally, did one single piece of energy infrastructure. Our highways and power grids were built and are still mostly maintained with public dollars. The huge trans-Alaska oil pipeline, for example, runs across nearly 800 miles of public and tribal lands. But there’s a time and a place for government support for energy projects, and it’s not when that support is literally a wealth transfer to huge multinational corporations that does little to increase production or reduce the cost of that energy to American consumers. What makes far more sense—and what we argue in our report—is a national commitment to a more advanced energy system that actually addresses climate change while, incidentally, spurring innovation and creating jobs. The fact is that America’s recent green investments, at the federal and the state level, have produced real and verifiable returns. For the past few years, the clean energy and sustainability sector has been the bright spot in the U.S. economy, creating more jobs—and higher-paying jobs at that—than the economy as a whole. Even during the Great Recession, the clean energy sector grew at a rate of 8.3 percent a year, on average—nearly double the growth rate of the overall economy. And on the renewable energy front, the entire nation has been making remarkable gains across a diverse portfolio of generation technologies. In Los Angeles County, for example, workers in the green sector command wages with a 50 percent to 100 percent premium over the average job in LA County. Compare that to the findings of the Western States Petroleum Association—an oil industry group—that half of California’s jobs directly related to fossil fuels are gas station attendants earning about minimum wage. Developing 54 gigawatts of offshore wind in Atlantic waters would generate $200 billion in economic activity and create 43,000 permanent, well-paid technical jobs, in addition to displacing the annual output of 52 coal-fired power plants. 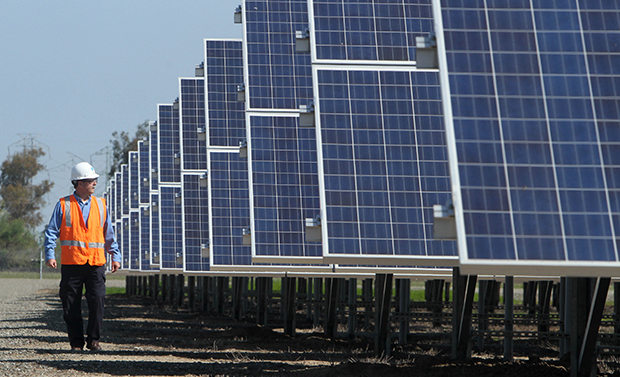 The solar industry in California has experienced significant growth over the past 15 years. Since 1995 the number of solar businesses in the state has grown by 171 percent, and total employment has jumped by 166 percent. As a point of comparison, the total number of California businesses has grown by 70 percent, and employment has increased by 12 percent. Retooling the auto industry to build the next generation of vehicles has proved to be one of the most effective elements of a national recovery, adding more than 230,000 direct jobs nationwide in manufacturing and auto sales since the low point of the recession in mid-2009. That adds up to 14 percent growth, far outpacing the economy as a whole. All these success stories, combined with the simple fact that clean energy helps slow climate change, help explain why the American public—those same taxpayers that the Institute for Energy Research cares so deeply about—overwhelmingly supports a move toward a cleaner national energy system. In fact, Harvard and Yale researchers find that the average American is willing to pay $162 per year more to support a national clean energy standard, which is just one policy we recommend in our report. There is still a long way to go when it comes to truly transforming our energy economy, but the seeds of that change are already sprouting in every region in the country. And one thing is for sure: If the American people have any say, that transformation will happen many, many, many millennia before the sun begins to show any signs of fatigue. Let’s hope, for the sake of our planet, it happens a whole lot quicker than that. Kate Gordon is a Senior Fellow at the Center for American Progress and the director of advanced energy and sustainability at The Center for the Next Generation in California. Thanks to Omar Aslam, research associate at The Center for the Next Generation, for his research support.